"There is more to religion than just just belief. For Instance, religion and religious organisations may help groups to cope with changes such as migration and adjustment to new societies. 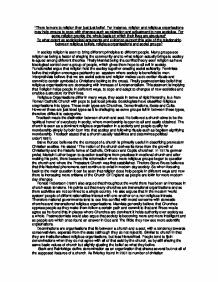 For some religion provide the whole basis on which their lives are structured" To what extent so sociological arguments and evidence support this veiw of the relationship between religious beliefs, religious organisations and social groups? In society religion is seen to bring different principles to different people. Many groups see religion as being a factor of shaping the community and to what religon actually brings to socitey is agued among different theories. Firstly Marxist being tha conflict theory seen religion as have ideological control over a group of people, which gives them hope to all evil in society. 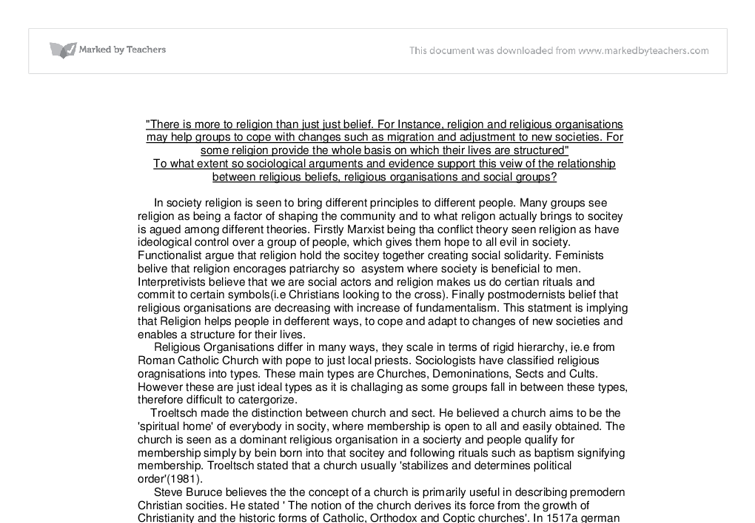 Functionalist argue that religion hold the socitey together creating social solidarity. Feminists belive that religion encorages patriarchy so asystem where society is beneficial to men. Interpretivists believe that we are social actors and religion makes us do certian rituals and commit to certain symbols(i.e Christians looking to the cross). ...read more. He stated ' The notion of the church derives its force from the growth of Christianity and the historic forms of Catholic, Orthodox and Coptic churches'. In 1517a german preist, Martain Luther began to question teachigns from practises in medieval church and after making his point, there became this reformation where more religious groups began to question the church and where the Protestant Church was first established. Thefore Steve Bruce believes that this historical phenomena cant continue to exist in modern day society. So when focusing back to the main question it can be seen that religion does help people in different ways and now there is increasing more critisms of the Church Of England as people are lokin for more modern day changes. Ronald Robertson (1987) also argued that throughtout the world there has been an increase in church-state tensions. He points out that many churches are transnational organizations and so there activities are not confined to a single country. He also argues that in the modern 'world system' people of differnt rationalities interact with one another on a non religious intrests. ...read more. Marxist wuld say this has been a results of people rebelling against the Church and soo increasinly moving away to forn denominations to better fit their beliefs. Steve bruce agreed as he stated that denominations are 'increasingly important'. Functionalists do not agree with denominatios as it changes society and these changes may eventually break down the way society operates. Sects are more radical protest movements set up in opposition to a dominant mainstream religion and generally critical of the state. They demand high levels of commitment. Offer support and alternative way of life and lack complex hierarchy. In 1995 Bruce stated 'From time to time the church would face dissent or revolt. People would protests against ecclesiastic pomp and wealth or would seek to live out a more radical form of faith. Those who could not be contained within the church broke away to form a sect. As they often challenged the state as much as the church, they were met with repression. For this, if for no other reason, sects were normally small' Examples of sects are People's Temple led by Jim Jones, Branch Davidians led by David Koresh and The Bob Jones University. There are 3 main reasons for why sects have increased and how sects become more appealing. ...read more. acid in Hazcard 98A "Methyl orange" in http://www.proscitech.com.au/catalogue/msds/c118.pdf and Hazcard 32 "Sodium carbonate" in: http://www.jtbaker.com/msds/englishhtml/s3242.htm and Hazcard 95A "Concentrations of solutions" in Daniels A., Johnston L.
It is vital that instruments deliver information quickly, inexpensively but most of all with high accuracy. An automatic titration device for use in either batch processing or a continuous processing mode to identify quantitative fluid properties. The device consists of a plurality of reservoirs each connected to a respective plurality of pumps. Equipment Errors Four pieces of equipment that I used could have had an error associated with them: the balance, the volumetric flask, the pipette and the burette. I will examine these errors in the form of percentage errors to look at their potential effect on the final value for the acid concentration (all to 2d.p.). The concentration of something is the number of moles of a product per given volume. SO the increase in concentration means that more particles are in closer contact with each other and the collision between the correct molecules is more likely.